Can Noodle and Zeek stop international treasure hunters and rescue their town? The Danger Guys are at it again! During a trip to the beach, best friends Noodle and Zeek try to relax and have a quiet, danger-free afternoon. But trouble follows these boys wherever they go. Before they know it, Noodle and Zeek find themselves stranded on a sinking boat in the middle of the ocean. 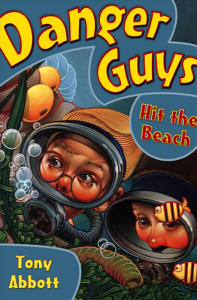 To escape, the boys jump on a surfboard and ride a giant wave to a nearby island. The island is where their town’s founder, Captain May, was shipwrecked hundreds of years ago. Noodle and Zeek soon discover that treasure hunters are on the island, searching for Captain May’s lost gold. But to find it, the hunters are going to blow the ship out of the water, which would cause a tidal wave big enough to destroy Mayville! With some quick thinking—and a little bit of help from some old friends—the boys fight to save their town from disaster.